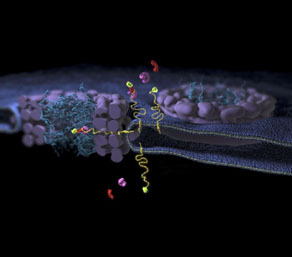 Figure: The membrane protein (yellow) is integrated in the membranes. The transport proteins (red, purple) recognize the address label to stretch the linker; they interact subsequently to the components in the center of the pore complex. The linker slices through the scaffold. Being at the right time on the right place in the cell is important for the function of proteins. This is well studied for soluble proteins transported into the nucleus of a cell. Those proteins bear a nuclear localization signal to be targeted into the nucleus. Transport proteins bind these address codes and bring the proteins from the cytoplasm across the nuclear pore complex into the nucleus. However, it was still unknown how membrane proteins were transported into the nucleus. In my thesis, I show that the address code on membrane proteins is attached via a long and unfolded linker domain. The flexible linker can easily be stretched, so that the address code can be away from the membranes. This provides a freedom of movement to the transport protein, while it is bound to the address code. The freedom enables the transport protein to reach the center of the pore complex, while the membrane protein is still in the membranes. The membrane protein is pulled through the pore complex via the linker. The linker needs to be flexible enough to cut through the scaffold of the pore complex. This new model describes a transport route of membrane proteins into the nucleus.